Long Room of Trinity College Library. Photo by RK. Pembroke Townhouse. Cute Georgian style hotel in Ballsbridge, ca. 15 walking minutes from the city centre. You can book it here. Holiday Inn Express Dublin City Center. Modern hotel on O‘Connell Street. You can book it here. Roly‘s. Elegant restaurant in Ballsbridge. Enjoy great seafood (try their prawn bisque) and Irish beef steak at its best. Pichet. Bistro and cocktail bar on Trinity Street. Pearl‘s. French fine dining in cosy cave interior. La Maison. Cute French bistro close to Grafton Street. Fish Shack Cafe. Get delicious fresh fish, e.g. at the Temple Bar branch. At the Bailey bar you can snack some Tapas and take yourself through the different tastes of Irish Whiskey. In the Gresham Hotel British afternoon tea is served nearly every day. 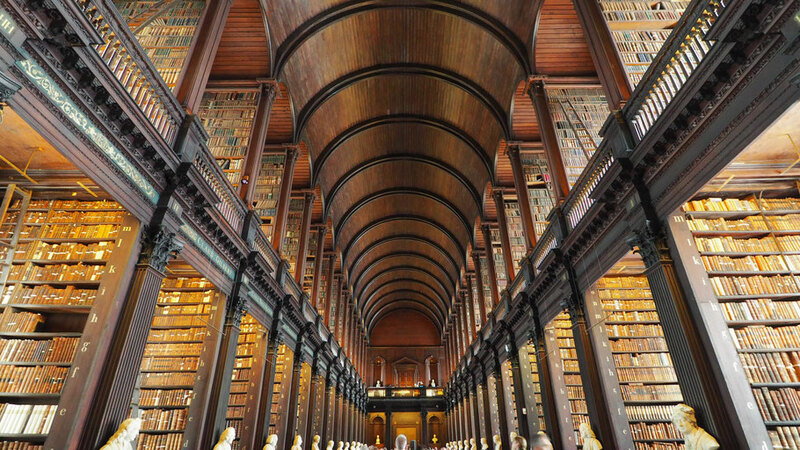 The Old Library of Trinity College houses the famous Book of Kells. The Long Room is very impressive and makes you feel like in a Harry Potter movie. National Museum of Ireland. Visit the three Dublin museums with free access and discover the country‘s past. Discover the huge Phoenix Park where you can also find Dublin Zoo, the U.S. Embassy and where deer are strolling around. Take a walk through busy Temple Bar district and experience pub culture with live "Trad" music. Cross the river Liffey over Dublin‘s landmark, the Ha‘Penny Bridge. If interested in brewery, visit the Guinness Storehouse. Its Gravity Bar offers a 360° view over the city. Book your tickets online in order to avoid queueing. Not visited but worth seeing: Kilmanhaim Gaol. Former jail that has been transformed into a museum. Tickets sell out fast, so book online. Shop some records and get lost in the vinyl collection of Tower Records. The hop-on/hop-off tourist buses in the city are convenient to visit the top sights and cost from around 15€. Bus tours into the countryside are offered at many places – visiting ruins and wool-weaving factories included.